Music is an auditory art comprised of meaningful arrangements of sounds with a relation to pitch, rhythm, and tonality. Another definition of music is "a natural and intuitive phenomenon operating in the spheres of time, pitch, and energy, and under three distinct and interrelated organization structures of rhythm, harmony, and melody." Since music is natural, it can be produced in nature by various creatures; and since it is intuitive, humans can recognize their sounds as musical. Moreover, as music is intuitive, people can virtually perform and even hear music in their mind. Generally, music is known through the cognition of specific arrangements of sounds and the emotional reaction that it engenders. Whether the music is a complex and intellectually demanding orchestral composition or a plaintive folk song, the range of responses can encompass the full range of human emotions. This makes the musical arts a universal expression of human experience. Music is a vital aspect of culture. It has the ability to invoke age-old traditions or to incite people to social change. Music's ability to connect individuals to social and cultural experience is one of its most important characteristics. Responses to music can often be visceral, and in the twentieth century the global appeal of jazz, blues, folk music, and rock and roll advanced egalitarian values and contributed to loosening sexual mores. In the twenty-first century the dissemination of emotionally charged music through new electronic media provides musicians and composers unprecedented worldwide exposure and influence. The ubiquitous influence of music in the modern world underscores the importance of responsible and enlightened artistic expression. Music's capacity to stir passions and affect attitudes and beliefs make it an important element for directing human consciousness toward values that can resolve animosities between races and cultures and inspire ideals that support humanity's collective aspiration for a culture of peace. Music is often defined by contrast with noise or speech. Some definitions of music place it explicitly within a cultural context by defining music as to what people accept as musical. Those that seek a platonic or quasi-platonic ideal of music which is not rooted in specifically physical or mental terms, but in a higher truth. The definition of music as sound with particular characteristics is taken as a given by psychoacoustics, and is a common one in musicology and performance. In this view, there are observable patterns to what is broadly labeled music, and while there are understandable cultural variations, the properties of music are the properties of sound as perceived and processed by people. Traditional philosophies define music as tones ordered horizontally (as melodies) and vertically (as harmonies). Music theory, within this realm, is studied with the presupposition that music is orderly and often pleasant to hear. In support of the view that music is a label for a totality of different aspects which are culturally constructed. Often a definition of music lists the aspects or elements that make up music. Molino (1975: 43) argues that, in addition to a lack of consensus, "any element belonging to the total musical fact can be isolated, or taken as a strategic variable of musical production." . Nattiez gives as examples Mauricio Kagel's Con Voce (with voice), where a masked trio silently mimes playing instruments. In this example sound, a common element, is excluded, while gesture, a less common element, is given primacy. The platonic ideal of music is currently the least fashionable in the philosophy of criticism and music, because it is crowded on one side by the physical view - what is the metasubstance of music made of, if not sound? - and on the other hand by the constructed view of music - how can one tell the difference between any meta-narrative of music and one which is merely inter-subjective? However, its appeal, finding unexpected mathematical relationships in music, and finding analogies between music and physics, for example string theory, means that this view continues to find adherents, including such critics and performers as Charles Rosen and Edward Rothstein. As to mathematics, it is found that music, particularly of the Baroque period has a measurable rhythm that enhances the learning process of the brain so that schools are known to use this as a method of study. The Piano is one of the most common forms of making music. The traditional or classical European aspects of music often listed are those elements given primacy in European-influenced classical music: melody, harmony, rhythm, tone/timbre, and Musical form. A more comprehensive list is given by stating the aspects of sound: Pitch, timbre, sound intensity, and duration. These aspects combine to create secondary aspects including structure, texture and style. Other commonly included aspects include the spatial location or the movement in space of sounds, gesture, and dance. Silence is also often considered an aspect of music, if it is considered to exist. As mentioned above, not only do the aspects included as music vary, their importance varies. For instance, melody and harmony are often considered to be given more importance in classical music at the expense of rhythm and timbre. John Cage considered duration the primary aspect of music because it is the only aspect common to both "sound" and "silence." "We must ask whether a cross-cultural musical universal is to be found in the music itself (either its structure or function) or the way in which music is made. By 'music-making,' I intend not only actual performance but also how music is heard, understood, even learned." Common terms used to discuss particular pieces include notes, which is an abstraction that refers to either a specific pitch and/or rhythm or the written symbol; melody, which is a succession of notes heard as some sort of unit; chord (music)|chord, which is a simultaneity of notes heard as some sort of unit; chord progression which is a succession of chords (simultaneity succession); harmony, which is the relationship between two or more pitches; counterpoint, which is the simultaneity and organization of different melodies; and rhythm which is the organization of the durational aspects of music. A guitar being played by a musician. Someone who performs, composes, or conducts music is a musician. Performance is a method for musicians to share music with others. A musical instrument is a device constructed or modified with the purpose of making music. In principle, anything that produces sound, and can somehow be controlled by a musician, can serve as a musical instrument. The expression, however, is reserved generally to items that have a specific musical purpose. The academic study of musical instruments is called organology. Wind instruments generate a sound when a column of air is made to vibrate inside them. The frequency of the wave generated is related to the length of the column of air and the shape of the instrument, while the tone quality of the sound generated is affected by the construction of the instrument and method of tone production. The group is typically subdivided into Brass, like the trumpet, and Woodwind instruments, such as the clarinet, bagpipes and flute. Lamellaphones create a sound by the plucking of lamellas made from different materials (metal, raphia etc.). These Instruments are tunable, so they do not belong to the idiophones. An example is the Mbira. Percussion instruments create sound, with or without pitch, when struck. The shape and material of the part of the instrument to be struck and the shape of the resonating cavity, if any, determine the sound of the instrument. Examples: drums, bells and cymbals. String instruments generate a sound when the string is plucked, strummed, slapped, etc. The frequency of the wave generated (and therefore the note produced) usually depends on the length of the vibrating portion of the string, its linear density (mass per unit length of string), the tension of each string and the point at which the string is excited; the tone quality varies with the construction of the resonating cavity. Examples: guitars, violins and sitars. Electric string instruments generate sound by a pickup placed under strings. The electric guitar and the electric bass are the most famous examples, but there is a wide variety of new instruments, because the electro-magnetic amplification generates new possibilities. Other Examples: 3rd bridge overtone koto, electric baritone, electric cymbalom. Electronic instruments generate sound through electronic means. They often mimic other instruments in their design, particularly keyboards, drums and guitars. Examples: synthesizers and theremins. Keyboard instruments are any instruments that are played with a musical keyboard. Every key generates one or more sounds; most keyboard instruments have extra means (pedals for a piano, stops for an organ) to manipulate these sounds. They may produce sound by wind being fanned (organ) or pumped (accordion), vibrating strings either hammered (piano) or plucked (harpsichord), by electronic means (synthesizer) or in some other way. Sometimes, instruments that do not usually have a keyboard, such as the Glockenspiel, are fitted with one. Though they have no moving parts and are struck by mallets held in the player's hands, they possess the same physical arrangement of keys and produce soundwaves in a similar manner. All classes of instruments save the electronic are mentioned in ancient sources, such as Egyptian inscriptions, the Bible and the many thousand year old Hindu Vedas, and probably predate recorded history. The human body, generating both vocal and percussive sounds, may have been the first instrument. Percussion instruments such as stones and hollow logs are another likely candidate. For instance, nine-thousand-year-old bone flutes or recorders have been found in Chinese archeological sites. Many cultures include strong traditions of solo (music)|solo or soloistic performance, such as in Indian classical music, while other cultures, such as in Bali, Indonesia include strong traditions of musical ensemble|group performance. All cultures include a mixture of both, and performance may range from improvised solo playing for one's enjoyment to highly planned and organized performance rituals such as the modern classical concert or religion|religious processions. What is called chamber music is often seen as more intimate than symphonic works. A performer is called a musician, a group being a musical ensemble such as a rock band or symphony orchestra. Music is often preserved in memory and performance only, handed down by oral history|orally, or aurally ("by ear"). Such music—especially that which has no known individual composer—is often classified as "traditional." Different musical traditions have different attitudes towards how and where to make changes to the original source material, from quite strict, to those which demand the art of improvisation. If the music is written down, it is generally in some manner which attempts to capture both what should be heard by listeners, and what the musician should do to perform the music. This is referred to as musical notation, and the study of how to read notation involves music theory. Written notation varies with style and period of music, and includes scores, lead sheets, guitar tablature, among the more common notations. Generally music which is to be performed is produced as sheet music. To perform music from notation requires an understanding of both the musical style and performance practice expected or acceptable. Most cultures use at least part of the concept of preconceiving musical material, or musical composition|composition, as held in western classical music. Many, but fewer, cultures also include the related concept of interpretation, performing material conceived by others, to the contrasting concepts of improvisation and free improvisation, which is material that is spontaneously "thought of" (imagined) while being performed, not preconceived. However, many cultures and people do not have this distinction at all, using a broader concept which incorporates both without discrimination. Improvised music virtually always follows some rules or conventions and even "fully composed" includes some freely chosen material. This is found in Jazz, notably with Miles Davis (Trumpet soloist) improvising against the orchestrations of Gil Evans. Also artists' improvisations in Jazz, have been orchestrated (Thelonious Monk) and solos even vocalised (called vocalese) a tradition including, Eddie Jefferson, King Pleasure, Lambert, Hendricks and Ross. See, (precompositional). Composition does not always mean the use of notation, or the known sole authorship of one individual. Mimicry is also used in music, where various instruments or voice are used to imitate nature or even urban sounds such as trains, cars, machinery, etc., or even bizarre, as in 'Ball and Chain,' a blues piece. Music can also be determined by describing a "process" which may create musical sounds, examples of this range from wind chimes, through computer programs which select sounds. Music which contains elements selected by chance is called Aleatoric music, and is most famously associated with John Cage and Witold Lutosławski. See: (precompositional), form (music), modulation (music)|modulation, twelve tone technique, serialism, and process music. Musical composition is a term that describes the makeup of a piece of music. Methods of composition vary widely, however in analyzing music all forms—spontaneous, trained, or untrained—are built from elements comprising a musical piece. Music can be composed for repeated performance or it can be improvised, or composed on the spot. The music can be performed entirely from memory, from a written system of musical notation, or some combination of both. Study of composition has traditionally been dominated by examination of methods and practice of Western classical music, but the definition of composition is broad enough to include spontaneously improvised works like those of free jazz performers and African drummers. What is important in understanding the composition of a piece is singling out its elements. An understanding of music's formal elements can be helpful in deciphering exactly how a piece is made. A universal element of music is time or more generally rhythm. When a piece appears to have no time, it is considered 'rubato'. The Italian term, meaning "free time," does not mean "without rhythm," but rather that the 'tempo' or time of the piece changes dynamically. Even random placement of random sounds, often occurring in musical montage, occurs within some kind of time, and thus employs time as a musical element. Any musical event comprised of elements can be considered a "composition." Music is experienced by individuals in a huge variety of social settings ranging from being alone to attending a large concert. Concerts take many different forms and may include people dressing in formal wear and sitting quietly in the rows of auditoriums, drinking and dancing in a bar, or loudly cheering and booing in an auditorium. Deaf or aurally challenged people can experience music by feeling the vibrations in their body; the most famous example of a deaf musician is the composer Ludwig van Beethoven, who composed many famous works even after he had completely lost his hearing. In more modern times, Evelyn Glennie, who has been deaf since the age of twelve, is a highly acclaimed percussionist. Also, Chris Buck, a violinist virtuoso and New Zealander, has recently lost his hearing. See: Baschet Brothers. See: psychoacoustics. The music that composers create can be heard through several media; the most traditional way is to hear it live, in the presence, or as one of, the musicians. Live music can also be broadcast over the radio, television or the internet. Some musical styles focus on producing a sound for a performance, while others focus on producing a recording which mixes together sounds which were never played "live." Recording, even of styles which are essentially live often uses the ability to edit and splice to produce recordings which are considered "better" than the actual performance. In many cultures there is less distinction between performing and listening to music, as virtually everyone is involved in some sort of musical activity, often communal. In industrialized countries, listening to music through a recorded form, such as a sound recording or watching a music video, became more common than experiencing live performance, roughly in the middle of the 20th century. Sometimes, live performances incorporate prerecorded sounds; for example, a disc jockey or DJ uses gramophone record|disc records for scratching. People often exercise to videos, radios, tapes or downloaded music on ipods, finding the music and/or rhythm enhances the workout. Audiences can also become performers by using Karaoke, invented by the Japanese, which uses music video and tracks without voice, so the performer can add his voice to the piece. Many people, including entire cultures, compose, perform, and improvise music with no training and feel no need for training. The 'look see' method seems to be popular too. Other cultures have traditions of rigorous formal training that may take years and serious dedication. Sometimes this training takes the form of apprenticeship. For example, Music of Indian training traditionally take more years than a college education and involves spiritual discipline and reverence for one's guru or teacher. In the music of Bali, everyone learns and practices together. It is also common for people to take music lessons, short private study sessions with an individual teacher, when they want to learn to play or compose music, usually for a fee. A famous private composition teacher is Nadia Boulanger. The Suzuki method is a way of teaching, or educational philosophy, most often used in learning to play music. The name is also sometimes used to refer solely to the sheet music books and/or audio recordings which have been published as part of the method. It was invented in the mid-twentieth century by Dr. Shin'ichi Suzuki. Dr. Suzuki noticed that all children pick up their native language very quickly, and even dialects which adults consider "difficult" to learn are spoken with ease by people of 5 or 6 years. He reasoned that if a person has the skill to acquire their mother tongue, then they have the necessary ability to become proficient on a musical instrument. He modeled his method, which he called "Talent Education" (jap. 才能教育 sainō kyōiku), after the process of natural language acquisition. Dr. Suzuki believed that every child, if properly taught, was capable of a high level of musical achievement. He also made it clear that the goal of such musical education was to create generations of children with "noble hearts" (as opposed to creating famous musical prodigies). The Suzuki method was first developed for the study of the violin but has been adapted for flute, recorder, piano, guitar, cello, viola, bass, organ, harp and voice. In addition, there are a few "Suzuki Preschools" which have adapted Dr. Suzuki's philosophy to use in non-musical disciplines. Contents Dr. Suzuki incorporated the Suzuki method in which a child is taught to learn an instrument through the parent prior to being schooled in primary education. The incorporation of music performance and theory into a general liberal arts curriculum, from preschool to postsecondary education, is relatively common. Western style secondary schooling is increasingly common around the world, such as STSI in Bali. Meanwhile, western schools are increasingly including the study of the music of other cultures such as the Balinese gamelan, of which there are currently more than 200 in America. Many people also study about music in the field of musicology. The earliest definitions of musicology defined three sub-disciplines: systematic musicology, and comparative musicology. In contemporary scholarship, one is more likely to encounter a division of the discipline into music theory, music history, and ethnomusicology. Research in musicology has often been enriched by cross-disciplinary work, for example in the field of psychoacoustics. The study of music of non-western cultures, and the cultural study of music, is called ethnomusicology. In Medieval times, the study of music was one of the 'Quadrivium' of the seven liberal Arts and considered vital to higher learning. Within the quantitative Quadrivium, music, or more accurately harmonics, was the study of rational proportions. Music theory is the study of music, generally in a highly technical manner outside of other disciplines. More broadly it refers to any study of music, usually related in some form with compositional concerns, and may include mathematics, physics, and anthropology. 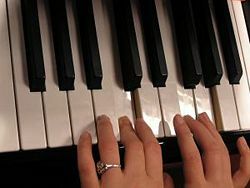 What is most commonly taught in beginning music theory classes are guidelines to write in the style of the common practice period, or tonal music. Theory, even that which studies music of the common practice period, may take many other forms. Musical set theory is the application of mathematical set theory to music, first applied to atonal music. Speculative music theory, contrasted with analytic music theory, is devoted to the analysis and synthesis of music materials, for example musical tuning|tuning systems, generally as preparation for composition. See "Common Terms" above. Musiconomy is a discipline that utilizes the tool developed in the twentieth century, the computer. A similar comparison can be made to astrology and astronomy. When Galileo Galilei introduced the telescope, astrology developed into astronomy. A computer allows the user (similar to a microscope) to focus inward. The observer of a telescope would view outwards into the cosmos. This study also relates to cognitive science. The history of music in relation to human beings predates the written word and is tied to the development and unique expression of various human cultures. Popular styles of music varied widely from culture to culture, and from period to period. Different cultures emphasized different musical instrument|instruments, or techniques. Music history itself is the distinct subfield of musicology and history, which studies the history of music theory. It was the Pythagoreans who discovered that the relationship between musical notes could be expressed in numerical ratios of small whole numbers. He discovered that by using the ratio 3/2, one could translate musical notes into mathematical equations. Pythagoras was interested in music as well as mathematics. He wanted to improve the music of his day, which he believed was not harmonious enough and too chaotic. Pythagoras believed in something called the harmony of the spheres. He believed that since planets and the stars all moved in the universe according to mathematical equations that these mathematical equations could be translated into musical notes and thus produce a symphony. He first described natural harmonies as being fundamentally pleasing more than 2,500 years ago. An octave, the notes of the scale, and certain harmonics such as the so-called "golden 5th," where the "so" and "do" notes are sounded together, are examples of these consonant sounds. The consonant tones, sounds generally associated with the words "in tune" and prevalent in Western music ranging as far afield as Beethoven and Motown, are able to attract the attention of infants. At the same time, children hardly respond to more dissonant combinations—for example, C and F sharp played together. These out-of-tune sounding notes are often used by atonal composers such as Schoenberg and Berg. Around 500 C.E., western civilization was plunged into the "The Dark Ages," the time when invading hordes overran Europe and brought an end to the former Roman Empire. But Christianity had established a hold, and for the next ten centuries, the newly emerging Christian Church dominated Europe, generally dictating the destiny of music, art and literature. This is the longest period of Western musical history and consists of almost a thousand years worth of music. The Church, then, was the focal point of social life, learning, and the arts. Pope Gregory I (590 - 640 C.E.) is generally believed to have collected and codified the music known as Gregorian Chant, a large repertoire of chants from the first centuries of the Christian church. This, then, became the approved music of the Church. It is not known who wrote these melodies, similar to folk music, it probably changed as it was passed down through generations. Much later, the University at Notre Dame in Paris saw the creation of a new kind of music called organum. Secular music was sung all over Europe by the troubadours and trouvères of France. Secular song was important to the medieval era, it was monophonic and stylistically more diversified than plain song. Early Medieval music notation did not look like the notation that is used in present day music. The earliest signs of a notational system notational system for music used neumes. For a long time, musical notation consisted of the pitch or note that was to be sung. Other musical notation, such as rhythm didn't begin until the twelfth or thirteenth centuries. Toward the latter part of the Middle Ages, music consisted of two or more melodic lines that were heard simultaneously, called polyphony. This appeared around the 1200s. Polyphony was more difficult to compose than the monophonic chant, because a composer had to combine multiple melodic lines in a way that would be pleasing to the listener. Generally considered to be from ca. 1420 to 1600, the Renaissance (literally meaning "rebirth") was a time of great cultural awakening of the arts, letters, and sciences throughout Europe. With the rise of humanism, sacred music began to break free of the Church, and composers trained in the Netherlands mastered the art of polyphony in their settings of sacred music. These polyphonic traditions reached their culmination in the unsurpassed works of Giovanni da Palestrina. Secular music thrived during this period, and instrumental and dance music was performed in abundance, if not always written down. The late Renaissance also saw in England the flourishing of the English madrigal, composed by such masters as John Dowland, William Byrd, Thomas Morley and others. Named after the popular ornate architectural style of the time, the Baroque period (ca. 1600 to 1750) saw composers beginning to rebel against the styles that were prevalent during the High Renaissance. This was a time when the many monarchies of Europe vied in outdoing each other in pride, pomp and pageantry. Many monarchs employed composers, at court, who were little more than servants expected to turn out music for any desired occasion. The greatest composer of the period, Johann Sebastian Bach and other composers of the time were able to break new musical ground, they created an entirely new style of music, the Baroque. It was during the early part of the seventeenth century that the genre of opera was created by a group of composers in Florence, Italy, and the earliest operatic masterpieces were composed by Claudio Monteverdi. The instrumental concerto became a staple of the Baroque era, finding its strongest exponent in the works of the Venetian composer Antonio Vivaldi. Harpsichord music achieved new heights, due to works by such masters as Domenico Scarlatti, etc. Dances became formalized into instrumental suites and composed by virtually all composers of the time. However, vocal and choral music still reigned supreme and culminated in the great operas and oratorios of German-born composer George Frideric Handel. From roughly 1750 to 1820, artists, architects, and musicians moved away from the heavily ornamented styles of the Baroque and the Rococo, and instead embraced a cleaner, uncluttered style reminiscent of Classical Greece. The newly established aristocracies were replacing monarchs and the church as patrons of the arts, and were demanding tuneful, elegant music. Dances such as the minuet and the gavotte were provided in the forms of entertaining serenades and divertimenti. At this time the Austrian capital of Vienna became the musical center of Europe, and works of the period are referred to as, the Viennese style. Composers came from all Europe to train around Vienna and gradually they formalized the musical forms that were to dominate European culture for the next several decades. A reform, of the extravagant Baroque opera, was undertaken by Christoph von Gluck, whilst Johann Stamitz contributed to the growth of the orchestra and developed the orchestral symphony. The Classical period reached its zenith with the masterful symphonies, sonatas, and string quartets by the greatest composers of the Viennese school: Franz Joseph Haydn, Wolfgang Amadeus Mozart, and Ludwig van Beethoven. During the same period, the first voice of the Romantic musical ethic can be found in the music of Viennese composer Franz Schubert. As the many revolutions of the late eighteenth-century established new social orders, new ways of life and thought, so composers of the period broke new musical ground, by adding emotional depth to the prevailing classical forms. Throughout the nineteenth-century (1820 to 1900), artists became intent in expressing their subjective, personal emotions. "Romanticism" derives its name from the 'romances' of medieval times. These long poems are stories of heroes and chivalry, of distant lands, far away places, often of unattainable love. The 'romantic artists' are history's first artists to give to themselves the name by which they are identified. The earliest Romantic composers were all born close in time to each other, in the early nineteenth century. These include; the great German masters, Felix Mendelssohn and Robert Schumann, the Polish piano/poet Frédéric Chopin, French genius Hector Berlioz and the great piano showman, Hungarian composer, Franz Liszt. During the early nineteenth century, opera composers such as Carl Maria von Weber turned to German folk stories for librettos, whilst Italians looked to literature of the time and created Bel canto opera (literally "beautiful singing"). Later in the century, the field of Italian opera was dominated by Giuseppe Verdi, while German opera was virtually monopolized by Richard Wagner. During the nineteenth century, composers from non-Germanic countries began looking for ways in which they might express the musical soul of their homelands. Many of these Nationalist composers turned to indigenous history and legends as plots for their operas, and to the popular folk melodies and dance rhythms of their homelands as inspiration for their symphonies and instrumental music. Others developed a highly personal harmonic language and melodic style which distinguishes their music from that of Austro-Germanic traditions. The continued enhancement of existing instruments, plus the invention of new ones, led to the further expansion of the symphony orchestra. Taking advantage of new sounds, new instrumental combinations, late Romantic composers in the second half of the nineteenth-century created richer and ever larger symphonies, ballets, and concertos. Two of the giants of this period are the German-born Johannes Brahms and the great Russian melodist Peter Ilyich Tchaikovsky. By the turn of the century, the next few decades, artists of all nationalities were searching for different modes of expression. Composers such as Arnold Schoenberg explored unusual and unorthodox harmonies and tonal schemes. French composer Claude Debussy was fascinated by Eastern music and the whole-tone scale, and created a style of music, named Impressionism, a la French painting. Hungarian composer Béla Bartók continued in the traditions of the still strong Nationalist movement and fused music of Hungarian peasants with twentieth century forms. Avant-garde composer, Edgard Varèse explored the manipulation of rhythms rather than the usual melodic/harmonic schemes. The tried-and-true genre of the symphony, somewhat modified by this time, attracted such masters as Gustav Mahler and Dmitri Shostakovich, whilst Igor Stravinsky gave full rein to his manipulation of kaleidoscopic rhythms and instrumental colors throughout his extremely long career. While many composers throughout the twentieth-century experimented in new ways with traditional instruments (such as the "prepared piano" used by American composer John Cage), many of the greatest composers, such as Italian opera maestro, Giacomo Puccini and the Russian pianist/composer Sergei Rachmaninoff, remained true to the traditional forms of music history. In addition to new and eclectic styles of musical trends, the twentieth century boasts numerous composers whose harmonic and melodic styles an average listener can still easily appreciate and enjoy. As there are many definitions for music there are many divisions and groupings of music, many of which are caught up in the argument over the definition of music. Among the larger genres are European classical music|classical music, popular music or commercial music (including rock and roll), country music and folk music. Opera, with the libretto set to music has been called the most complete art in that it incorporates all the arts: auditory, visual and dramatics. Variations of this of course include, operetta or light opera (the Merry Widow, Gilbert & Sullivan etc. ), vaudeville, and the modern musical (perhaps the most original American art-form along with the Blues). There is often disagreement over what constitutes "real" music: Mozart, Stravinsky, serialism, jazz, hip hop, punk rock, and electronica have all been considered non-music at various times and places. Of course Classical music is generally played strictly according to written scores but improvisation is known, for instance, with Beethoven, who would often do so freely and Gabriela Montera the modern Argentine-born pianist who plays Classical concerts and improvises in clubs. 'Cross-over artists,' are those that have embraced more than one musical genre. For instance; Keith Jarett, pianist, the Marsalis brothers, Wynton (trumpet) and Branford (soprano saxophone) Jazz artists are equally at home in the Classical genre. Divas such as, Dame Kiri Te Kanawa and Kathleen Battle have been known to sing Popular Standards, Gospel and even lullabies in different languages. Genres of music are as often determined by tradition and presentation as by the actual music. While most classical music is acoustic and meant to be performed by individuals or groups, many works described as "classical" include samples or tape, or are mechanical. Some works, like George Gershwin's Rhapsody in Blue, are claimed by both jazz and classical music. The idea of 'free music' as in 'free jazz' is an example of music trying to stretch itself within the boundaries of that genre. 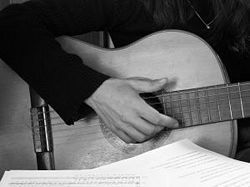 In Folk-Rock or Classical-Rock, forms show the unity of different genres trying to exist together as with many 'new waves', New Flamenco, New Age, composites of traditional forms with computer generated sounds and on and on. As world cultures have been globalization|in greater contact, their indigenous musical styles have often merged into new styles. For example, the US-American bluegrass style contains elements from Anglo-Irish, Scottish, Irish, German and some African-American instrumental and vocal traditions, and could only have been a product of the twentieth century. These mixing of styles have been named World Music and covered diverse destinations from Haiti to the Himalayas, and musical styles from arabesque to samba, and big successes have included Salsa, Paris Café Music, Cajun & Zydeco, Highlife, African Rap and Bellydance. Some, producers see a clear connection between world music and social change, and have established good relationships with a number of development and human rights organizations. Religious music (also sacred music) is music performed or composed for religious use. Music has been composed to complement religion, whilst many composers have been inspired by their religions or directly by the Spirit. Forms of traditional music have been adapted for religions' purposes or were descended from religious music. G. Palestrina wrote masses for the Roman Catholic church whilst Johann Sebastian Bach, wrote music for the Lutheran church. Religious music often inspires and draws upon themes from the wider culture and conversely may inspire works of secular music. Arab classical music, Persian classical music, and North Indian classical music have shaped the devotional music of Muslims. In Japan, Shinto ceremonial music is related to Gagaku or old festival music. Contemporary Christian music uses idioms from various secular popular music styles—but with religious lyrics. Gospel music has always done this, for example incorporating funk, and continues to do so. Religious music may have a characteristic tonality. Some have interpreted the textures of European homophony, in which all tones relate and resolve into a tonic, as artistic expressions of monotheism. This may be contrasted with Asian heterophony, expressing polytheism or pantheism. Navajo music's cyclic song and song-group forms are noted by some to mirror the cyclic nature of their deities, such as Changing Woman. The Hindu bhakti tradition utilizes music and dance to tell the stories of the deities Krishna and Lakshmi, Rama and Sita; poets in this tradition, such as Jayadeva (eleventh century), Vidyapati (1375), Chandidas (fourteenth-fifteenth century), and Meerabai (1555-1603) wrote songs set to music expressing their devotion to God. The Sikh kirtan, which also originated out of this tradition, involves the singing of the sacred hymns from the Guru Granth Sahib to music. The Psalms of the Bible were set to music and sung as part of the ancient Israelite temple service; Jews to this day sing them in synagogue worship. Hymns and worship songs, many of them derived from the psalter, play an important part in Christian worship. Certain New Testament fragments are probably early hymns, some of which are still sung in the Orthodox liturgy. Sephardic music, the music of Spanish Jews, was born in medieval Spain, with cancioneros being performed at the royal courts. There are three types of Sephardic songs—topical and entertainment songs, romance songs and spiritual or ceremonial songs. Lyrics can be in several languages, including Hebrew for religious songs and Ladino. Beginning in the 1960s, various cultural observers predicted that factors such as the increasing secularization of society and the turn toward a self-centered individualism would inevitably cause the decline of religion in America. Yet those same observers were surprised by the stability and vitality of American religion in the last three decades of the twentieth century. Princeton University sociologist Robert Wuthnow argues in his book, All in Sync, that this vitality might in large part be traced to music and the arts. "One of the most important reasons that spirituality seems so pervasive in American culture," he writes, "is the publicity it receives because of its presence in the arts." Consider, for instance, how the search for spirituality in America pervades even popular songs such as Bette Midler's "The Rose" and Madonna's "Like a Prayer," television shows such as "Highway to Heaven" and "Touched by an Angel," and the thinly veiled religious messages of box-office hits "Star Wars" and "The Lion King." Both individuals and churches find in art and music sources of vitality for the spiritual life. For example, music and the arts play a central role in worship services at Willow Creek Community Church in Chicago, one of the nation's largest churches. The contemporary worship services at Willow Creek include orchestral, jazz, rock, and pop music, skits and plays, video clips, and Bible verses flashed on screens from overhead projectors. The power of music to uplift the spirit and comfort the human soul hints at its largely untapped potential to support the cause of world peace. Pop anthems like "We Are the World" are written to promote charitable causes and encourage a global consciousness. ↑ Jean-Jacques Nattiez. Music and Discourse: Toward a Semiology of Music, Translated by Carol Abate. (Musicologie générale et sémiologue, 1987 (1990), 47-48, 55. ↑ Harold Owen. Music Theory Resource Book. (Oxford University Press, 2000). ↑ Julian Johnson. Who Needs Classical Music? : Cultural Choice and Musical Value. (Oxford University Press, 2002). ↑ Dane Harwood, (1976). "Universals in Music: A Perspective from Cognitive Psychology," Ethnomusicology 20 (3): 521-533. ↑ Robert Wuthnow. All in Sync: How Music and Art Are Revitalizing American Religion. (California University Press). Harwood, Dane (1976). "Universals in Music: A Perspective from Cognitive Psychology," Ethnomusicology 20 (3): 521-533. Johnson, Julian, Who Needs Classical Music? : Cultural Choice and Musical Value. Oxford University Press, 2002. ISBN 0195146816. Molino, Jean. (1975). "Fait musical et sémiologue de la musique," Musique en Jeu 17:37-62. Nattiez, Jean-Jacques. Music and Discourse: Toward a Semiology of Music, Translated by Carolyn Abbate (1990). (Musicologie générale et sémiologue, 1987). ISBN 0691027145. Owen, Harold. Music Theory Resource Book. Oxford University Press, 2000. ISBN 0195115392. This page was last modified on 31 October 2018, at 15:45.